A goal on 90 minute by striker Sean Noble gave struggling Ballinamallard United a priceless point against Linfield last night. But it was nothing more than the Ferney Park side deserved after a spirited performance. The point, their second in a week, closes the gap against Carrick Rangers. 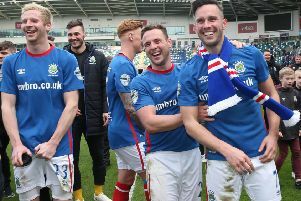 Linfield had fought back from a goal behind with two goals in the second half, the first from former Mallard Mark Stafford and the second, a dubious penalty from Andy Waterworth. Linfield though, had their young keeper Alex Moore to thank for the game not being out of sight with two excellent stops in the first half and another in the second when he saved a point blank range when Noble found himself through on goal. Mallards manager Harry McConkey said he would have been disappointed if his side had come away from the game without at least a point. “I thought the players were superb. They were prepared to play and they were brave enough to keep their shape when we lost possession and we scored a wonder goal,” he enthused. “At that stage you are starting to dream a little - we could possibly do this. Then again we knew Linfield’s biggest threat was always going to be their set plays and the delivery of the ball is so good that it is difficult to defend sometimes. “If I was Carrick I would probably start to get a little bit nervous because we are moving forward with our form and our results. They are in our sights, but we have a lot of work to do. Linfield manager David Healy said: “Ballinamallard were working for their lives. We knew it was going to be a difficult game, but as poorly as we played we got out of jail by going 2-1 up but the mistake at the end cost us. “When you look at the goal the ball given away but we didn’t deal with the aftermath of the first mistake and credit to Ballinamallard they got a good equaliser. “The last five or 10 minutes of the game probably sums up where our season is at. We make a mistake and get punished. Other teams have made mistakes throughout the year and we haven’t capitalised on them. “The players are disappointed as a group tonight. After a scoreless first half, and on 57 minutes the home side found the net. An excellent move involving O’Flynn and McGinty saw the ball drivien wide to Noble. His superb cross was met by Ryan Curran to head the ball into the far corner giving keeper Moore no chance. That sparked Linfield into life with Waterworth linking well with Clarke to shoot for goal, but his effort was well dealt with by keeper Richard Brush. On 67 minutes keeper Moore was called on again to make another good stop, this time from Noble, after excellent link up play from McGinty and Curran and withinn two minutes the champions were level. A corner on the right was headed powerfully home by Stafford. Seven minutes later the Blues were awarded a penalty when O’Flynn was adjudged to have handled the ball and Waterworth slotted the spot kick home. It looked all over for the Ferney Park side after replacement Josh McIlwaine was red carded for a rash tackle. But on 90 minutes McGinty slipped a good ball to Curran whose first time curling pass fell into the path of the supporting Noble who raced through the Linfield defence to slott past keeper Moore and win a priceless point for the Ferney side in their fight to stay in the top flight.